The form is the exterior expression of content, the configuration used by an idea to contact the world. Formaje gathering will show the interpretation of the forming action by several artists and a call for any isslustrator who likes to experiment. Theme: illustrate any meaning of the word “formaj/e” (forming) – the action of giving forming, giving a form to an object. The only limitations are the format of the Formaje Sketch Page (22.5 x 22.5 cm) and the deadline – 21.04.2013. After a month the gallery will show the best works generated by this gathering. Sound trip insured by NAVA SPATIALA. Formaje – the essential Romanian artfiles is a project of UrbanArt association. 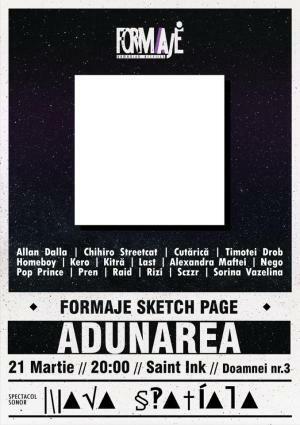 "Formaje Sketch Page - The Gathering" Art Show in Bucharest. You can get here description, reviews, address, time and details of "Formaje Sketch Page - The Gathering" Art Show in Bucharest. Visit Bucharest Tips for more Art Show events in Bucharest!